This Door Sign Is More Effective Than Magnetic Models! 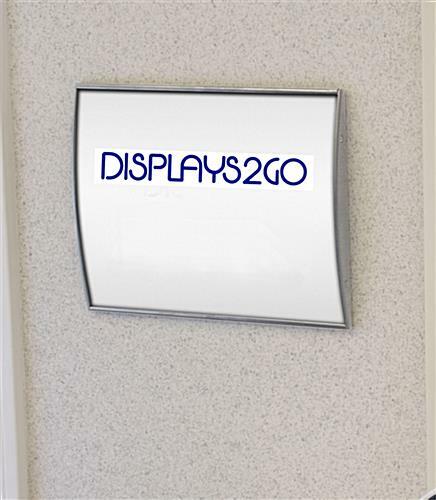 This Custom Office Signage Holder Is a Safety Display for Way Finding Systems! This Door Sign Can Be Purchased with Confidence! No-glare protective overlay prevents image tampering and sun damage. 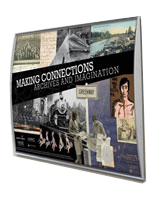 Two-sided tape made of foam allows users to hang frame portrait-style or landscape-style. Metal construction is very strong to last a long time, with a good looking silver finish. This door sign, similar to a name plate, has an attractive silver coloring on the framing. The modern appearance will coordinate well with many different decors. 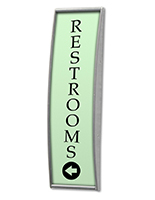 This door sign may be used to demarcate areas or inform patrons. The safety poster holder is often implemented to present the number of a room, the logo of a company, the name of an employee and other custom artwork. 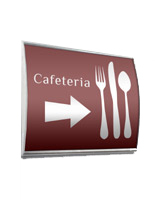 This door sign can be used in multiples to set up directional systems. The unit does not include any graphics or messages. 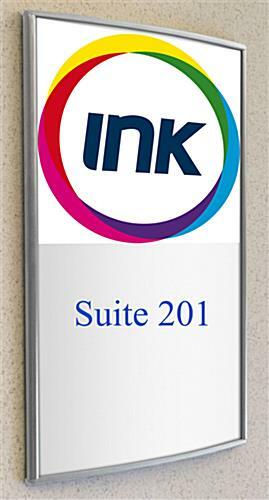 This door sign, however, allows users to insert their own messages printed out on a standard printer. The process will alleviate the costs of going to the printing press. 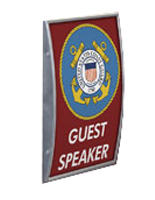 This door sign features two pieces of double sided foam tape for attaching the model directly to the wall or other display surface. 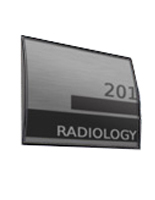 Unlike cheap magnetic framing, the signage holder maintains a permanent position. This door sign may be positioned in either landscape or portrait. Users can choose the orientation that best fits the display content. 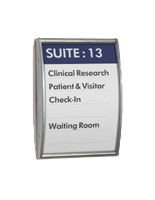 This door sign designed for office settings, sometimes called signage systems, is a great choice for the lobby of buildings, medical centers, schools, hotels and businesses that need to direct visitors or guests to their destination. This door sign features a curved design which garners a good deal of attention. The convex shape adds to the overall aesthetic appeal. 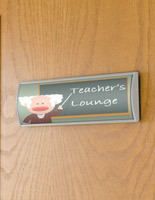 This door sign that affixes to the wall is also a wonderful option to use within the entranceway or hallway! The safety signage holder is fabricated out of anodized aluminum with plastic end caps for increased longevity. 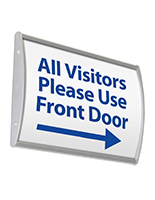 This door sign makes graphic changes extremely convenient because users do not need to take the unit off the wall when altering messages. 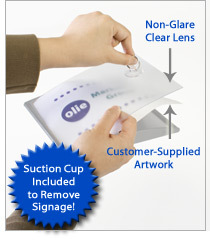 The aluminum signage holder comes with a non-glare lens that protects the contents. This door sign also includes a suction cup for removing the plastic overlay. Users need to take off the front and insert their latest messages to change out content.